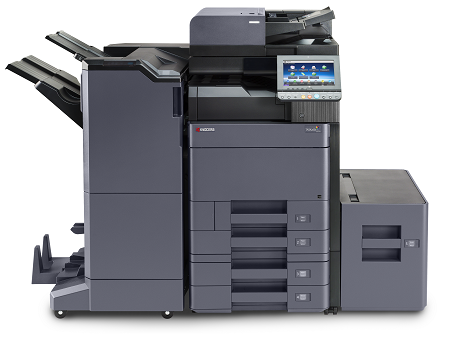 Kyocera provides the industry’s most comprehensive line of award-winning low to high volume black and white copiers and multifunctional products (MFPs). This high-performance MFP will not fail to impress. 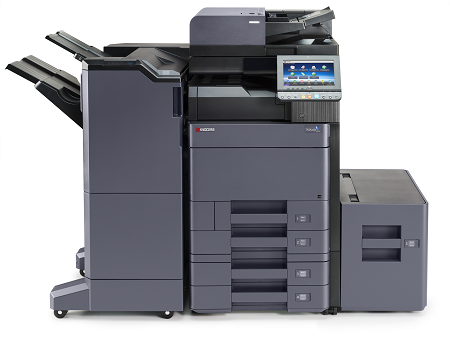 The TASKalfa 8002i delivers amazing black and white prints utilizing its true 1200 x 1200 dpi resolution. With an input paper capacity of 7,650 sheets and optional finisher capable of delivering professionally competed booklets and tri-fold leaflets, this device is designed to maximize productivity. A new 9” color touch screen offers an intuitive portal to all features and applications, as well as allowing this device to be seamlessly incorporated into a customers’ current and future workflow solutions portfolio. 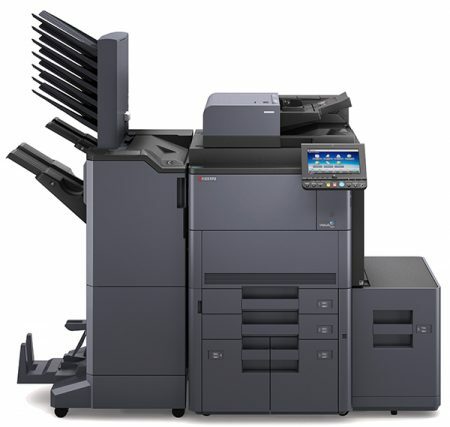 The new TASKalfa 7002i is a high-speed MFP that likes to be challenged. It will print, copy, scan and optionally fax all your documents quickly and reliably, no matter how large and complex the jobs are. 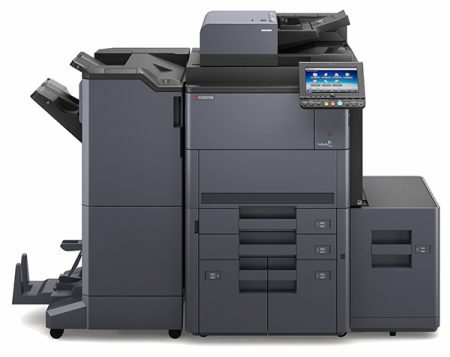 With its advanced paper handling options and the massive input and output capacity, it is especially designed for busy offices or centralized printing departments. Thanks to new toner technologies, the print results are sharper and more detailed than ever. 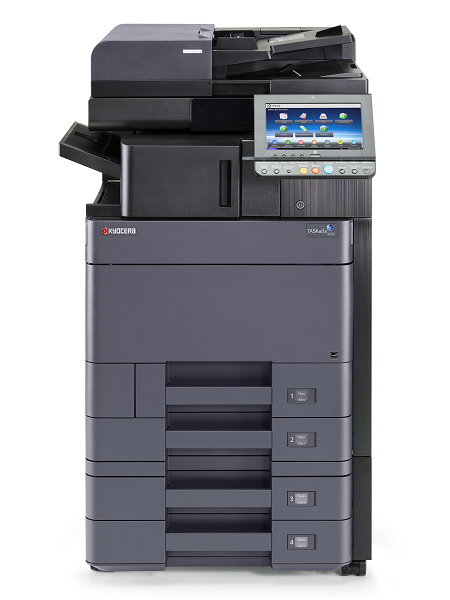 The combination of outstanding color quality, high speeds and high-capacity document processing makes the new TASKalfa 6052ci a very impressive multifunctional device. Supported by advanced technology, productivity is further enhanced with flexible paper-handling options and fast, economical and reliable printing. And when it comes to optimizing workflows, this color multifunctional, with its range of digital functions and optional Fiery controller puts the power firmly in your hands. With output and scan speeds of up to 60 ppm and 180 ipm respectively, the TASKalfa 6002i is a multifunctional device that keeps your productivity flowing. Heavy workloads are dealt with easily thanks to flexible, high-capacity finishing options and a paper capacity of up to 7,150 sheets. While its impressive range of digital document management functions are quickly accessible via an intuitive, large color touch panel. Sensitive documents are protected too thanks to enhanced security functions. The TASKalfa 5052ci is a multi-faceted device that offers equal amounts of impressive speed, versatility and high-quality color print brilliance in one package. When dealing with large output volumes, you can rely on KYOCERA’s long-life technology to minimise downtime and keep things running smoothly. Finally, the TASKalfa 5052ci fits easily into your own existing business workflow thanks to our unique HyPAS™ solution platform and additional (optional) Fiery™ controller. When looking for a highly-productive workplace partner, look no further than the TASKalfa 5002i. This multifunctional device offers high-capacity finishing options so even the heaviest of workloads will benefit from uninterrupted productivity. Access to a wide range of digital document management functions is straightforward thanks to the intuitive, large color touch panel and your sensitive documents are well protected thanks to enhanced security functions. The new TASKalfa 4002i is a reliable multifunctional device that will put you firmly in charge of your office documents. Highly flexible, productive and reliable, this office all-rounder offers a wide range of digital document solutions that will optimize your workflow. 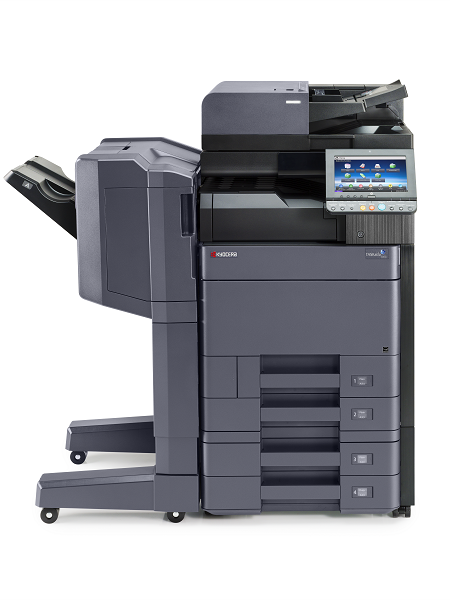 The intuitive color touchscreen offers access to a world of copying, printing, color scanning and optional faxing possibilities and numerous paper-handling and finishing options will not fail to impress. 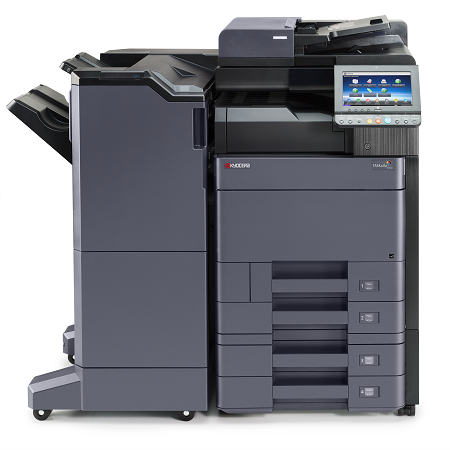 The TASKalfa 3252ci provides high-quality, vibrant color output and maximum flexibility for your office. Whether printing, copying or scanning, advanced technology delivers perfect document management. Superior sharpness and vividness will amaze you and a variety of paper-handling and modular finishing options mean this new multifunctional device can be relied upon to comfortably handle all of your office document requirements, too. Thanks to our software platform HyPAS you can easily tailor the TASKalfa 3252ci to your needs, no matter how your business workflow is organized.